As anybody who’s familiar web analytics will tell you, visitors can be fickle and will bounce off your site in a matter of seconds if you fail to grab their attention fast. A five second test can be used to measure the first impression given by your landing page. What do participants think a page is about, after viewing it for just five seconds? 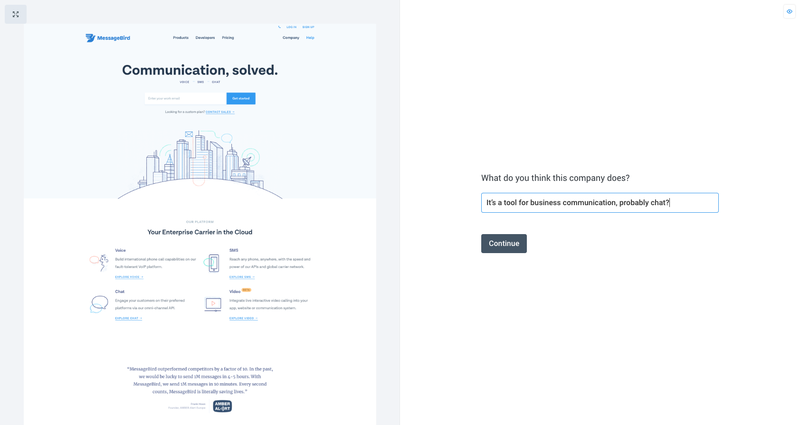 It’s a cheap and simple test to validate the intent and design of your landing pages. If test participants can’t confidently identify what the page is about, it’s likely that ordinary visitors will share this experience, and bounce away from the page. Alternatively, if your landing page gives participants the wrong impression, your best visitors may be the first to leave. What do you think that website was about? What product or service do you think that website offered? What was the most prominent element on the website? How would you start a trial/demo? Have a look at the resulting word cloud first, and then be sure to read and categorize each response. This will help to give you a clear picture of what the test results are saying. In the results for the sample test, a basic categorization of the responses shows that 23 of 50 participants grasped the nature of the service — and a lot of the ‘incorrect’ answers were in the right ballpark. For a page that uses fairly generic copy and headlines, this isn’t an overwhelmingly positive result, but it’s decent. Given these results, a short survey would be a great follow up to help to drill into precisely what the design communicates well, and what needs to be clarified or reworked in the design.